The United States and United Kingdom will conduct joint cyber “war games” against each country’s banks, financial institutions, and other critical infrastructure in order to improve defenses against cyber attacks. Additionally, the two allies will create a joint “cyber cell” featuring agents from both countries that will conduct the war games and share information on threats, as well as the best ways to combat hackers. The US division has already been staffed with members of the FBI, National Security Agency, GCHQ, and MI5,the Guardianreported. The first war game will occur later this year with the help of the Bank of England, and will target institutions in London and on Wall Street. Later exercises will test other infrastructure such as power suppliers and transportation systems. The news comes as British Prime Minister David Cameron arrived in the United States Thursday to meet with President Barack Obama for two days of talks. The two are slated to discuss boosting the global economy and terrorism, as well as cyber security. 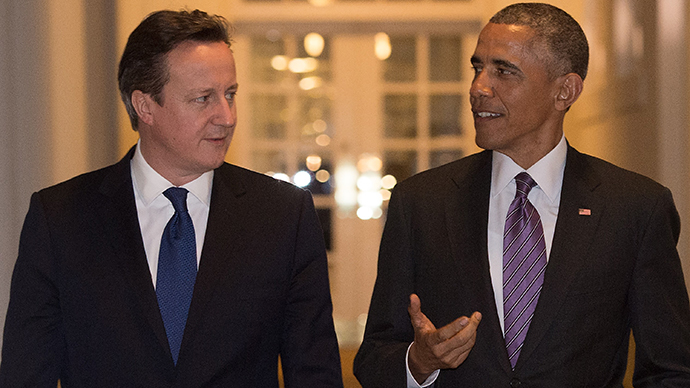 Prior to meeting with Obama, Cameron commented on the joint cyber initiative. “Just as we have worked with our closest ally, the US, to protect our people and our countries from traditional threats, so we must work together to defend ourselves from new threats like cyber attacks,” he said. Part of the cyber security deal also includes setting money aside to train the next wave of cyber agents. “The joint exercises and training of our next generation of cyber-experts will help to ensure that we have the capability we need to protect critical sectors like our energy, transport and financial infrastructure from emerging threats,” said Cameron. Cameron is also expected to ask Obama to pressure social media giants like Facebook and Twitter to share information with UK intelligence agencies so that the government can more effectively monitor threats made online. Facebook and Twitter offer encrypt communication services for users that government agents cannot access, and hardware companies like Apple and Google are also offering encryption to those who use their devices. These developments have sparked criticism from both US and UK officials, who have argued that law enforcement and national security agencies need easier access to data in order to prevent criminal and terrorist acts. Civil liberties group Privacy International (PI) warned that Cameron and his Conservative party are guilty of “cynical opportunism” in the aftermath of the French terror attacks. “Government officials...rally in the name of freedom and human rights claiming that the terrorists will never win and hate us for our freedoms. Then moments later...they attempt to curtail our rights they boldly proclaim in public as unassailable,” a spokesman for the group said. Earlier this week, Obama highlighted the danger of cyber attacks in the wake of the Sony hack and proposed new measures to enhance security. Obama called on Congress to pass legislation that would improve information sharing between the private sector and the government. He also said that the law should compel companies to quickly notify customers when their data has been breached. However, his data-sharing plan also came under fire from privacy advocates who are wary of surveillance concerns following revelations about the NSA’s wide-ranging domestic surveillance programs.